I thought you might enjoy the story connected with this baptismal apron, c. 1735. 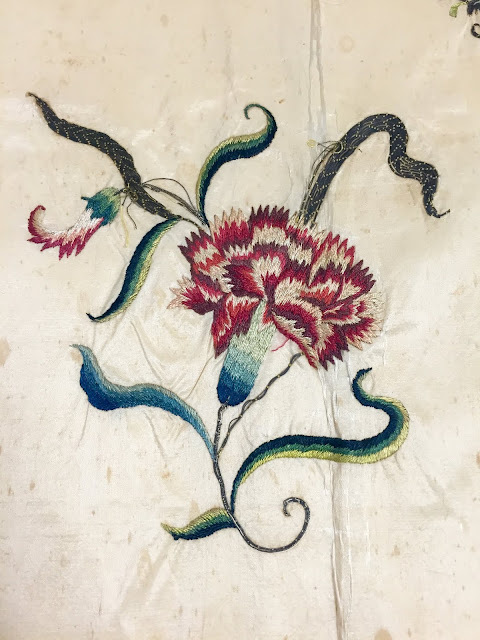 Currently on view in Fashioning the New England Family at the Massachusetts Historical Society (10/2018-4/2019; www.masshist.org), it was embroidered by Mary Woodbury (1717-1748) of Beverly, Massachusetts. 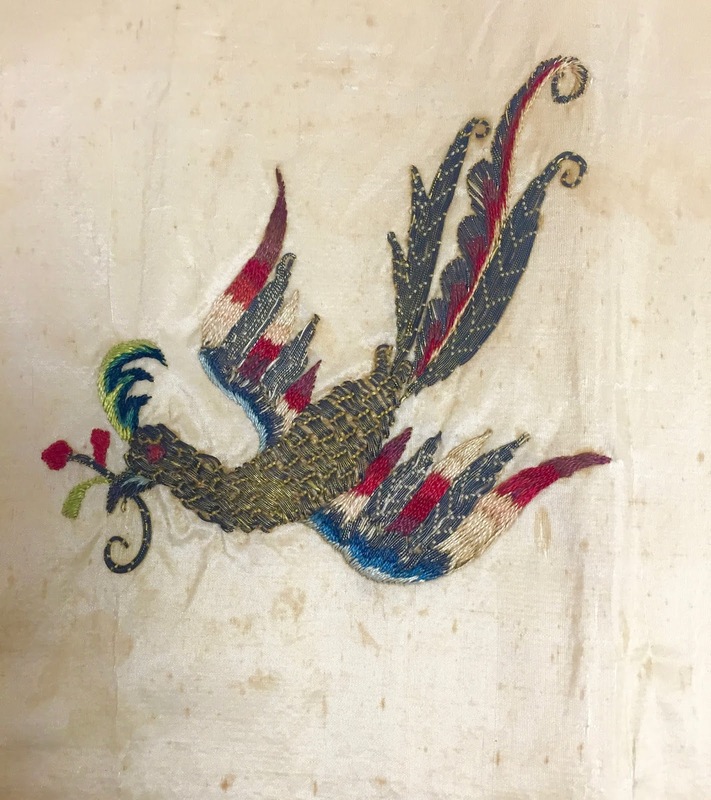 Using familiar 18thcentury iconography inspired by Asian motifs -- vases/urns of exotic flowers, flying phoenix/hoho birds--it is replete with silk and metallic threads, as well as small spangles. 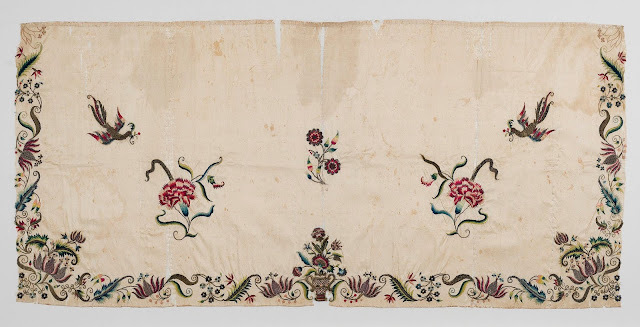 The primary stitches are flat and satin stitches. The colors are still bright against an extremely fragile silk ground. Born on March 3, 1717, the maker may have attended a female academy in Boston. She married Dr. Benjamin Jones on March 3, 1736/7. She died the day before her 31stor 32nd birthday. 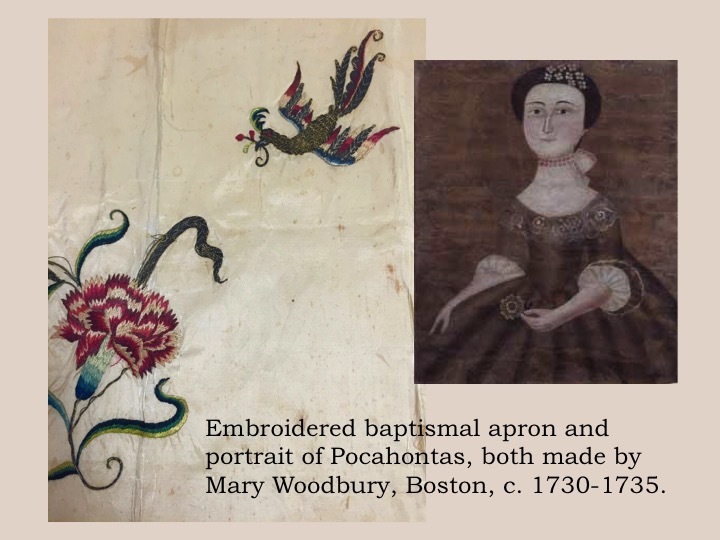 The baptismal apron was most likely made for her own child, embroidered when Mary was around age 18-19. After her death on March 2, 1748, her belongings were carefully saved for her daughter, Lydia, by Dr. Jones' second and third wives. Lydia later married the Rev. Thomas Lancaster, who was minister of Scarborough, ME. from 1775 to 1831. Given by the grandchildren of Dorothy Lancaster Libby, through Charles Thornton Libby of Portland, ME, on August 5, 1931.